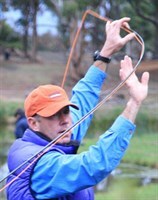 A twice silver medal winner at these events, on one occasion Peter cast a single handed fly rod an incredible 74 meters. 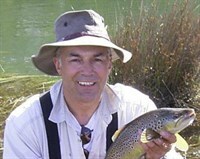 For a number of years Peter has worked with the Australian Fly Fishing team as their skills coach. I first met Dave more than 15 years ago when he came along to one of my regular casting classes. 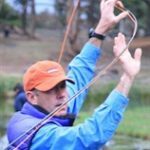 These days David has become one of Australia’s best Federation of Fly Fishers Certified Casting Instructors. A great credit to him. Dave was a previous disciple of Mike Spry’s and had many years fishing in the Snowy Mountains under his belt. Dave also owned his own raft which was previously one of Mike’s Swampy River rafts. David has guided with us for the past 8 seasons and all the clients enjoy his educational talents and his light entertaining demeanour. David has a sport-fishing boat at Miena and whilst he loves to guide anglers in Tasmania’s iconic Central Highlands David’s heart really lies in the Northern Midland meadow streams and rivers. A few years ago David became the proud owner of a Boulder drift boat that he imported from Colorado. On a day off David loves to float gently down the Macquarie River in Northern Tasmania flicking dry flies to sight fished trout. Another of Dave’s loves is building and casting bamboo rods. Dave recently spent a week in the United States learning rod building under the guidance of the great maker Jeff Wagner. Forever the student, David has recently taken to Two Handed Spey Casting with gusto. David has been a tutor at the ‘Hayes on Brumbys’ weekend workshops since their inception.